Baseball Ross and I have lived in Clearwater for the last two years. We moved here specifically for the baseball. From Spring Training, to Extended Spring Training, to Gulf Coast League, to the Fall Instructional League and the Florida State League Clearwater Threshers, there’s a lot of baseball to see. For the ten prospects on the list, they are players I have watched and am excited to see progress. 1. 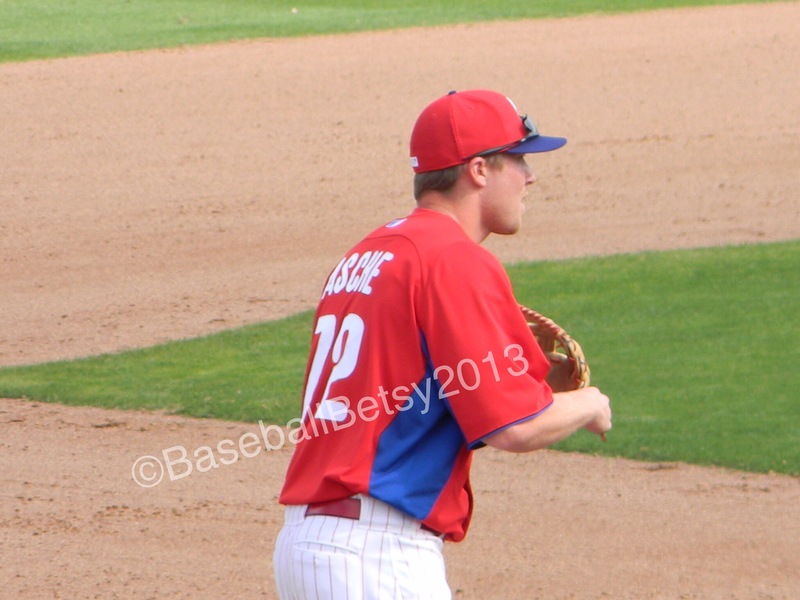 Cody Asche. Recently called up to the majors, he has always been a guy that we’ve had our eyes on. He’s a solid third baseman and has the numbers to back that claim. We watched him most of last season with the Threshers before he was moved up to Reading. 2. 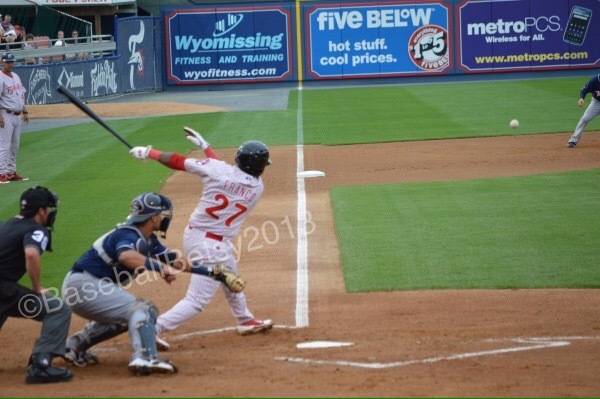 Maikel Franco. 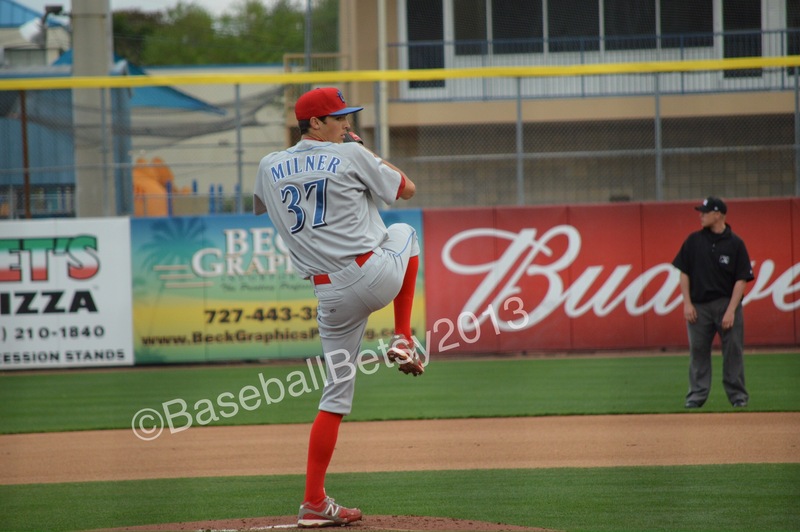 He started the season here in Clearwater before moving to Reading. He plays third and what we like about him is that he has soft hands. He will field the ball, taking time to catch it, then will fire it with laser-like precision. He can also hit the long ball. 3. Jesse Biddle. This much-touted southpaw certainly has what it takes. During a game in April that we watched on MiLB.tv, he racked up sixteen strike outs in seven innings against Harrisburg. He also lead the Eastern League in strike outs at the all-star break. 4. Severino Gonzalez. He’s moved around a lot this season, Extended Spring Training, Lakewood and Clearwater. Gonzalez has been both a reliever and a starter this season and been successful no matter when he’s pitched. 5. Kelly Dugan. He started the season on the disabled list but has come back to amaze. He has a bat that most people notice, but what impressed me was his arm. I saw him catch a ball deep in right field and fire it to third with pinpoint accuracy. No bounce. 6. JP Crawford. A first round draft pick this year, he’s already shown why. He started in the Gulf Coast League and has already leap-frogged over Williamsport to Lakewood. This 18 year old short stop was hitting as high as .380 before being sent to Lakewood last week. 7. 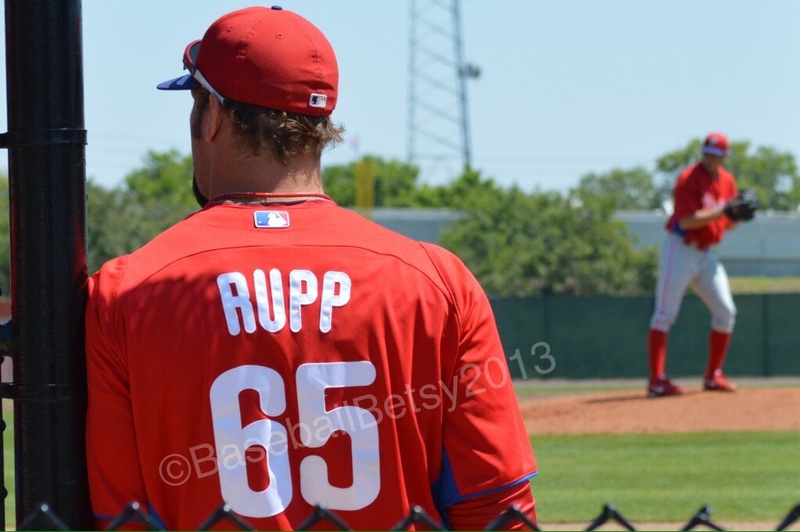 Cameron Rupp. 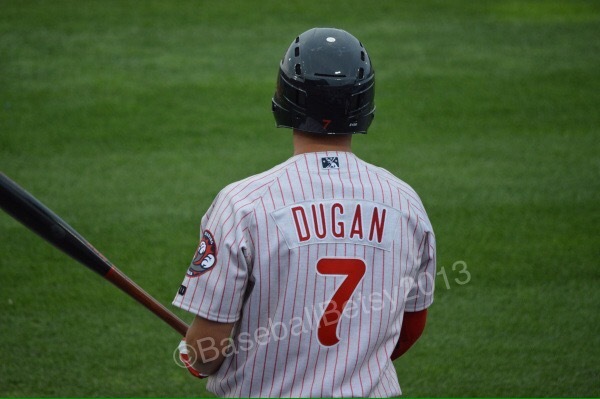 Rupp played in Clearwater last season, started this year in Reading and has already moved up to Lehigh Valley. He’s a solid back stop. He hits and is a great defensive player. While he may not be the replacement for Ruiz next year, could he be a solid back up for the Big Team? 8. 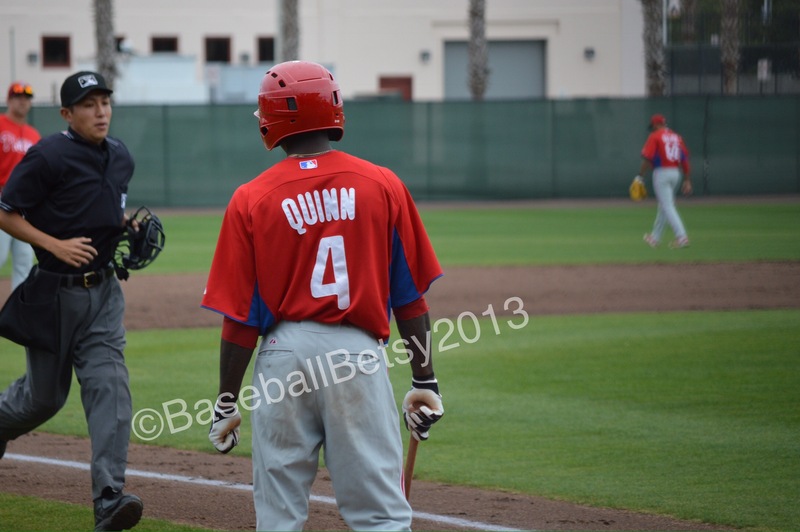 Roman Quinn. This shortstop had an on-base percentage of .669 and 32 stolen bases before being sidelined by a broken left wrist. He’s one of the fastest players we’ve even seen. While he’s been a little error-prone, his speed more than makes up for it. 9. Cameron Perkins. He is a solid outfielder with a very strong arm and bat. He was hit by a pitch during a game and suffered a broken wrist. He’s returned to the team though he is just getting his timing back and looks to finish the season strong. 10. Kenny Giles. This reliever is one to watch. Last season, we saw him hit 101 on the speed gun in Dunedin. While not quite as fast after his injury this year, he still has a fast ball that just can’t be hit. 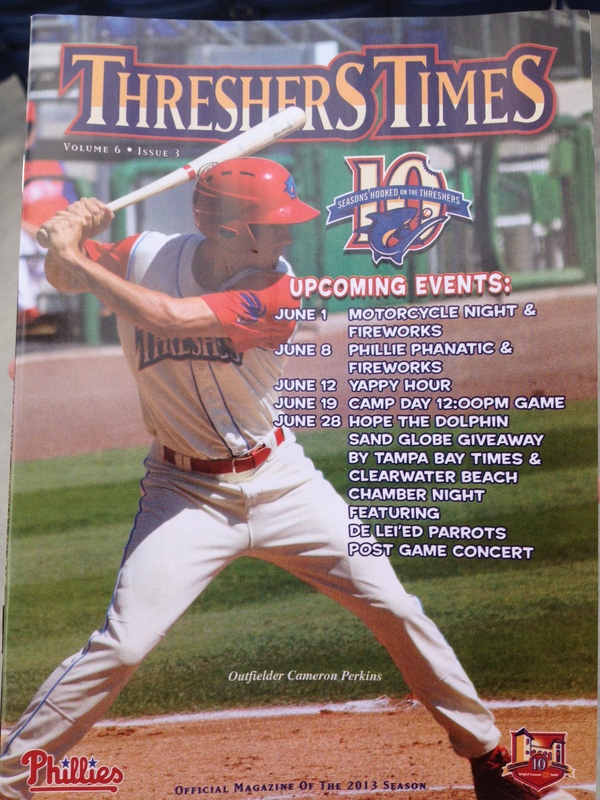 Hobby Milner-This Threshers pitcher is one to watch. He’s one pitcher we will go out of our way to see. After his first three starts of the season, he’s become one of the most consistent pitchers. With 11 wins and is tied for the most wins in the Florida State League. Finally, our ‘Unsung Hero’ award would go to Carlos Alonso. Alonso is spending his second year in Clearwater. He’s one guy that we truly admire, we can’t think of another player who plays as hard, every single play. He’s a solid second baseman who has only had two errors all season. He also has a knack for getting on base, drawing walks and scoring runs. 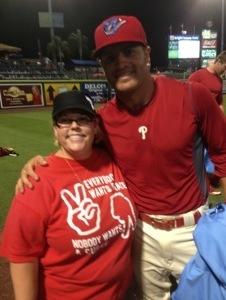 Carlos Alonso posing with me after signing his jersey for me. It’s summer here in Florida. 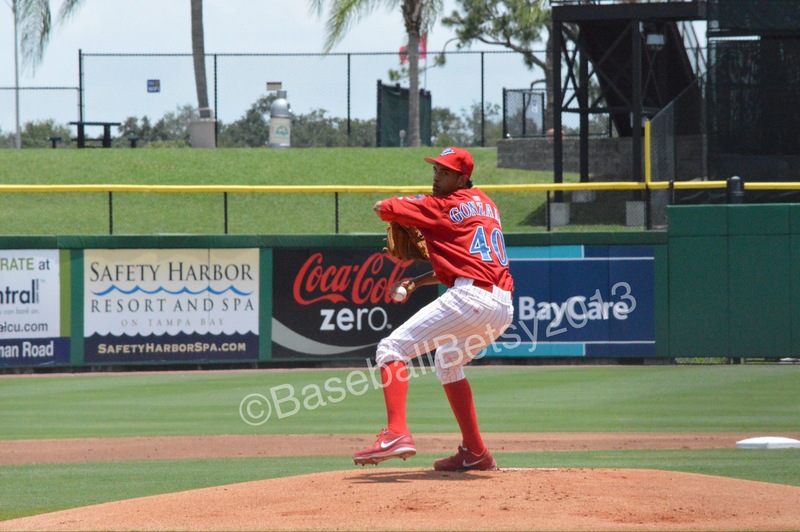 Yesterday was supposed to be the beginning of the Gulf Coast League season with the GCL Phillies playing the GCL Blue Jays at the Carpenter Complex. As it often happens here in Florida, we left our home just a few miles from the Complex and the sun was out and there were only big fluffy clouds. Three miles later, the sky had opened up and as we neared the Complex it was obvious that they had had a good amount of rain. The drainage culverts that were usually empty were more than half full and there was standing water in both the outfield and infield at the Complex. We were informed that the game was cancelled and that a double header would be held on Saturday at the Blue Jay’s Englebert Field. We went to a local eatery for lunch and they were without power–which may show how much worse the weather was in Clearwater as opposed to Dunedin. Today started out beautiful, sunny and a light breeze and since we had rain last night, the temperature was good. Ferdinand hit one to center that SHOULD have been caught, but as it wasn’t he goes to first, Joseph to second and James scores! The opening day pitcher for the Phillies was Feliberto Sanchez. He’s a 19 year old out of the Dominican Republic. Sanchez was impressive in his first start. By the end of his 3 innings, he gave up 2 hits, no runs, no walks, hit one batter and 2 strike outs. When he left the game the Phils were up 5-0. 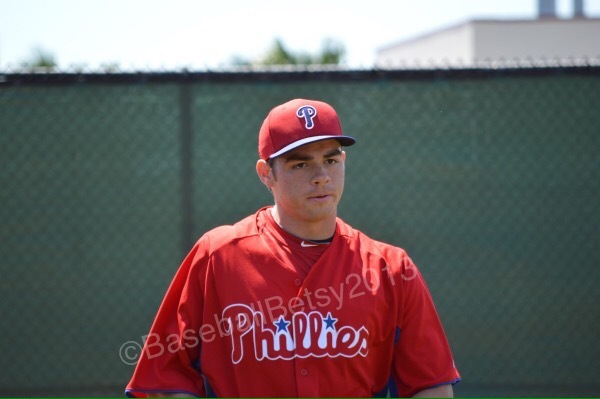 Next to pitch for the Phils was Mark Leiter. His line 1 inning, no hits, no runs, no walks and 1 strike out. In the fifth, Matt Soren came in to pitch and the wheels came off for the Phils. Soren looked great for the first two batters then fell apart. Soren’s final line was 2/3 of an inning, 3 hits, 3 runs, 1 walk and 1 strike out. Phils still up 5-3. Ronald Mendez came in to finish the inning and pitched the sixth and gave up a run, but it was unearned as it was the result of an error. Phils up 5-4. In the seventh, Cody Forsythe, gave up 3 hits, one run and no walks or strikeouts. So what was supposed to be the last inning of the first game of a double header…wasn’t and not by long shot. The game ended up going FOURTEEN innings. Ricky Bielski was the highlight of the next two innings. Bielski went 2 innings 1 hit, no runs, no walks, 3 strike outs. He had good command and when he started the 2nd he got behind with a 3-0 count, he got the batter to ground out to second. What impressed me is that after that 3-0 count, he struck out the next two batters. It was good to see that during this first game of the season. I was impressed. In the fourteenth, the Jays managed to score and ended the game. It was a hot one, 92 degrees and sunny with little to no breeze. I called it a day. I was fried by the sun, very hot and downed almost 80 ounces of iced tea to cool off! I left game two to more hardy folk, like Baseball Ross. It’s been a good couple of weeks if you live in/around Clearwater, like Baseball Ross and I. With all of the players that have been injured (not that we wanted that to happen) we’ve had the opportunity to see many of them rehabbing here in Clearwater. In just the last few weeks, we’ve seen Freddy Galvis, Drew Naylor, Derrick Mitchell, Tyson Gillies among others. It’s even better when we can see the guys return to action. As I wrote on Tuesday, Derrick Mitchell is “back in the saddle”. He’s had at least one homer, a triple and several well hit balls that without the wind, most likely would have left Ashburn Field. I’ve also gotten to see another guy I’ve been watching for a few years return to play, Tyson Gillies. 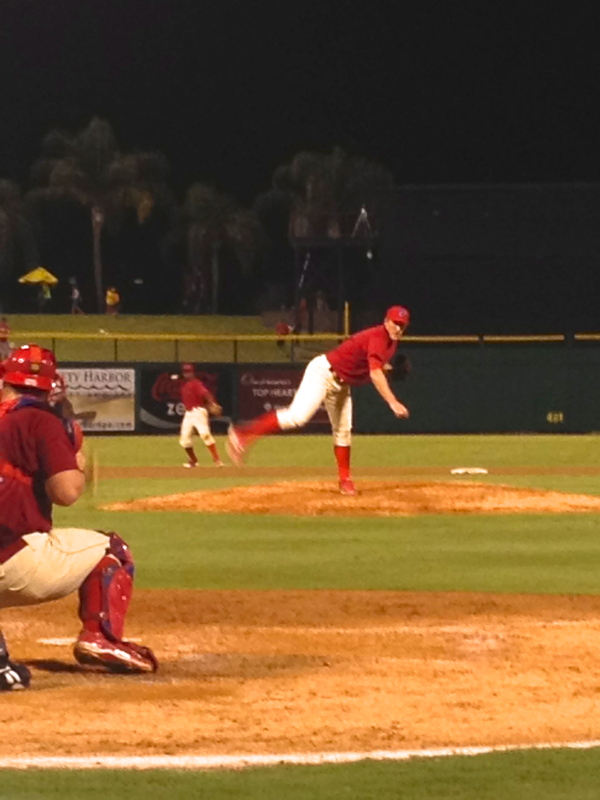 During my “hiatus” a few weeks ago, I was at the Carpenter Complex watching a Gulf Coast Phillies game. I was walking over to the bleachers to sit down and who was sitting on a stool also watching the game? Drew Naylor. I said, “Hello” and asked how he was. He was very nice and we had a nice conversation about how his rehab was coming along. Fast forward to last night, Drew returned to the bump. It was good to see my favorite Aussie back in action. Hopefully, they’ll all return back to their respective teams in the near future. Until they do, I’ll be happily going to every home game to watch them play and cheer them on.